Mumbai, 23 May 2018: Fujifilm India Private Limited, a pioneer in imaging technologies, is delighted to announce the launch of the much awaited GFX50s medium format mirrorless camera that is effectively built to achieve the best image quality. Adopting a 43.8ｘ32.9mm medium format (FUJIFILM G Format) sensor with 51.4 MP. Featuring premium design and excellent operability stemming from the highly reputable digital camera "X Series" system and the accumulation of image design technology from over 80 years of experience, the GFX 50S achieves the highest ever image quality from Fujifilm. To complement the GFX50S perfectly, Fujifilm is also releasing FUJINON GF Lens series- a new camera system capable of creating the world's highest level of photographic expressions. The line-up includes seven interchangeable lenses- GF23mmF4 RLM WR, GF45mmF 2.8R WR, GF63mmF2.8 R WR, GF110mmF2 R LM WR, GF120mmF4 R LM OIS WR macro, GF250mmF4 R LM OIS WR and GF32-64mmF4 R LM WR, providing every professional, the splendor of photography and the joy of taking photos. The GFX50s delivers uncompromised performance across stills and video shooting, in addition, a new Color Chrome Effect feature has been added. This feature can be used to reproduce the tones and deep colors, in situations often said to be difficult hence making GFX50s as an “attainable luxury”. Fujifilm India has very aggressive plans for the expansion of its X Series in the Indian Market. The company plans to expand its touch points by focusing on increasing its retail presence as well as enhance customer touch and try experience. The company also plans to expand its After Sales Service by adding 50 more service collection points by the end of FY 2018 taking it to a total of 100 service collection points. Additionally, the company is also looking at setting up Fujifilm Professional Service by the second half of this fiscal. 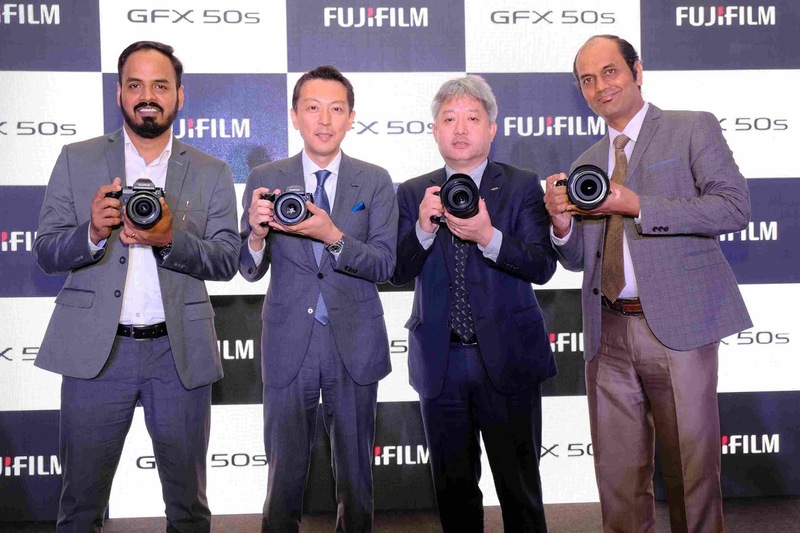 Fujifilm India will be investing heavily in marketing promotions, workshops, exhibitions, online promotions and photographer associations to build the X Series Brand further. With these initiatives the company’s goal is to capture30% Market Share in the Mirrorless Camera and Lens Market in India in the next 3-4 years. The FUJINON GF23mmF4 R LM WR: has a focal length equivalent to 18mm in the 35mm format and is perfectly suited for landscape and architectural applications. Despite the super-wide angle of view, distortion is kept to a minimum, and with the high-resolution performance extending all the way to the edges, sharp depiction power as if looking at an actual landscape is achieved. It features fast and quiet AF due to a linear motor, is dust and weather resistant, and is capable of operating in environments as cold as -10°C. The lens combines high performance and reliability as a professional work tool. The FUJINON GF45mmF2.8 R WR: is a highly versatile wide angle lens with a focal length equivalent to 36mm (on a 35mm format) and maximum F2.8 aperture. Thanks to its compact and lightweight design (weighing only 490g), this lens is ideal for street and documentary photography. The FUJINON GF63mmF2.8 R WR: This lens features an angle of view of approximately 50mm in 35mm format equivalent. Adopting a compact and stylish design, the external form of this small and lightweight lens has a diameter of just 84.0x71.0mm with a weight of only 405g. The optical system features a construction of 8 groups and 10 elements, including 1 ED lens element. This lens type was adopted being the most suitable for a compact size, with the utmost priority placed on resolution performance. The FUJINON GF110mmF2 R LM WR: is a medium telephoto lens for portraits. With a focal length equivalent to 87mm in the 35mm format, it achieves a brightness of F2.0 when used wide open to deliver beautiful bokeh. The high resolving power of the area in focus and the rich bokeh unique to medium format fast lenses depicts portraits with a realistic three-dimensional feel. The FUJINON GF120mmF4 R LM OIS WR macro: The optical system features a construction of 9 groups and 14 elements, including 3 ED lens elements. By adopting a floating focus method using a linear motor, silent and high-speed autofocusing is achieved while aberrations from long distances to short distances are corrected in a satisfactory manner, dramatically increasing the resolution. Furthermore, by arranging the ED lenses in a well-balanced manner, chromatic aberrations are also properly corrected, contributing to a high-quality image. The FUJINON GF250mmF4 R LM OIS WR: is a telephoto lens that achieves approximately 198mm in 35mm format equivalent, bringing together Fujifilm’s proprietary optical design technology: it offers high resolving power for supporting further enhancement of image resolution in the future. The lens can capture the atmosphere of any scene through a combination of high-resolution performance and rich bokeh effect. Attaching the “GF1.4X TC WR”, a 1.4x teleconverter provides coverage for telephoto shooting up to approximately 277mm in 35mm format equivalent, without any image quality deterioration. The FUJINON GF32-64mmF4 R LM WR: The optical system features a construction of 11 groups and 14 elements, each using one of the three types of lens elements, aspheric lens, ED lens and super ED lens, including the large aperture high precision aperture lens, achieving high image quality equivalent to single-focus lenses from wide angles up to standard focal distances. As a result, the lens demonstrates extremely high performance from the centre all the way to the edges. The lens adopts an inner focusing method, reducing the weight of the focus lens and achieving fast and silent AF by driving focusing using a linear motor.